Walking into a classic shop house in Bangkok is always a bit of an excitement these days. Is the the older generation still running the show, has the younger generation taken over and how do they perform? At Yong Lee, a hundred meters into Sukhumvit Soi 39, the older generation is still handling the kitchen equipment. And I tell you, they do it with the same elegance as they have done for as long as you or I can remember. The pitty is that the third generation probably won’t continue. But it all started out in 1944 in the former location close to Benjasiri Park. Mr. Keepong Sae Dan had collected a number of high quality recipes from friends and relatives before opening the Hainanese restaurant. He took the wise decision of not hiring a cook. And the family, with five of his ten children running the show today, have sticked to that decision ever since, keeping the recipes in the family and the quality high. Mr. Keepong himself died at 104 years in 2014, and when I talked to one of his sons, a man in his sixties, he was rather sure that the next generation didn’t want take over; it’s different times now, he says, and this kind of work is to demanding. He doesn’t know how long they will continue. 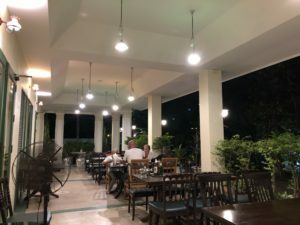 Young Lee (not to be mixed with another restaurant with the same name in Soi 15) has a great location, only 100 meters into Sukhumvit Soi 39 and close to BTS Phrom Phong. The interior is classic old, but the wooden chairs are slowly being replaced with plastic when they get worn down. The walls has a few memorabilia. That said, there’s no doubt that Yong Lee would have benefitted from a few layers of new paint. But at the same time, it’s a glimpse into the old times. It’s a bit of an anachronistic place, some would even say uncool. Others will call it charming. Personally, I really enjoy these old secrets. Whatever side you’re on, the food can’t be argued about. A delightful testimony to the Hainanese kitchen and immigrants coming here at the turn of the 20th century – where many of them started to cook. Hainanese chefs had a good reputation and was hired by western households or consulates. With a western household they started the fusion of Chinese ideas into European dishes, quite often with a tangy Oriental edge to it. Ox-tongue stew, pork shop and beef salad being some good examples of recipes where east meets west. But this time, I didnt go for any of the them. I choose the garlicky fish maw (swim bladder), the deep-fried pieces of snapper (fish) coated in a garlicky syrup and stir-fried with peppercorns (Pla Kapong Pad Prik Dam), but also their famous Poo Jaah (crab cake) with Sri Racha sous. It’s crispy on the outside and soft on the inside. 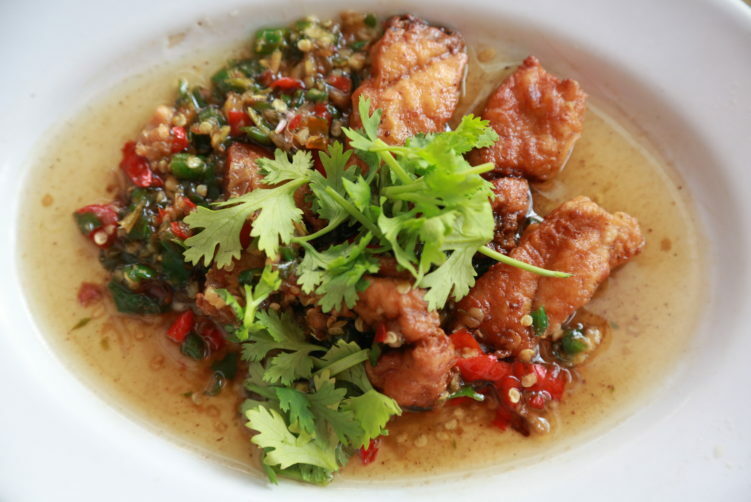 The snapper is deep fried before it’s stir fried with fresh chili peppers and a sweet salty sauce. It’s not as spicy as it might look and includes a delicious sweetness that fits perfect with a bowl of rice. The fish maw (swim bladder) was excellent as well, at least if you like garlic as I do. Don’t forget a few drops from the bottle of the double-horse Worchester sauce on the table as it adds a pleasant sour seasoning. And their crab cake didn’t disappoint either. It has a slight similarity with a crab omelet, but the outside is more crispy. Sri Racha is a slightly tangy sauce made from a paste of chili peppers, distilled vinegar, garlic, sugar, and salt. A very common dipping sauce in Thailand, especially for fish. Most of the food at Yong Lee hasn’t really changed much since the 50’s, an older guy in the neighborhood tells me. Luckily, he adds. But of course some new herbs have been added, together with a few thai dishes incorporated into the menu. The food is definitively Sino-Thai, still with ideas in heart and soul in the North of China, or it is European dishes with a clear Sino-Thai influence. Young Lee has a home style intimacy and laid-back atmosphere with their open front entrance and simple decoration. With the modernization and new high rise buildings next to it, there’s a certain charm with and old timer as Yong Lee. I hope they stay forever, but my presumption is that they will not. Property prices and new times will at some point force them out. But as long as we have them, I will enjoy their excellent food. 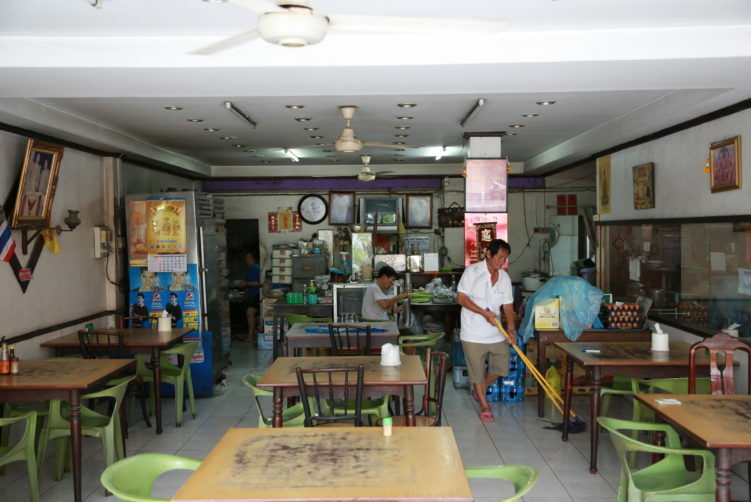 You have another similar (food wise) hole in the wall in Chairoj close to Phaya Thai. Both Yong Lee and Chairoj is classic “cook-shops” – consisting of a sparse dining room without air-condition, an open front towards the street and a counter in the back of the room where the owner sits. The chairs and tables are most often in dark wood. 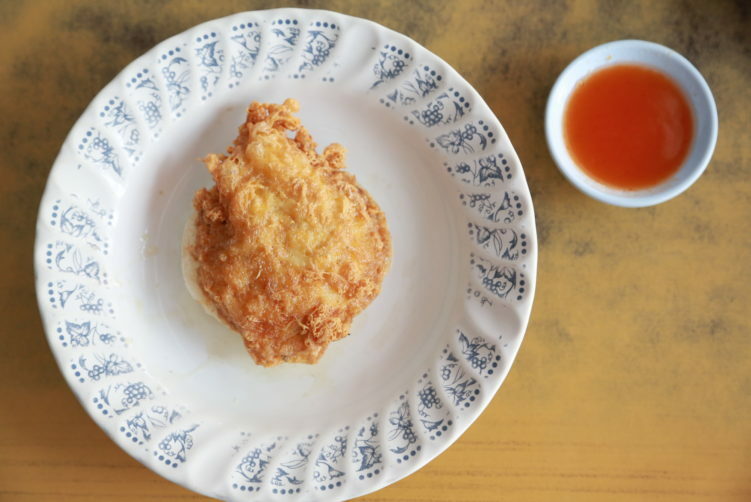 The food isn’t just Hainanese anymore, but have been influenced by the decades of operating in Bangkok. Many of the Hainanese chefs was hired by british households back in the old days, creating a fusion of Chinese ideas with European dishes. The food at Yong Lee are slightly pricier then the usual street food vendors, but that said, it still reasonable priced with most dishes cost between 90 and 140 baht on average. 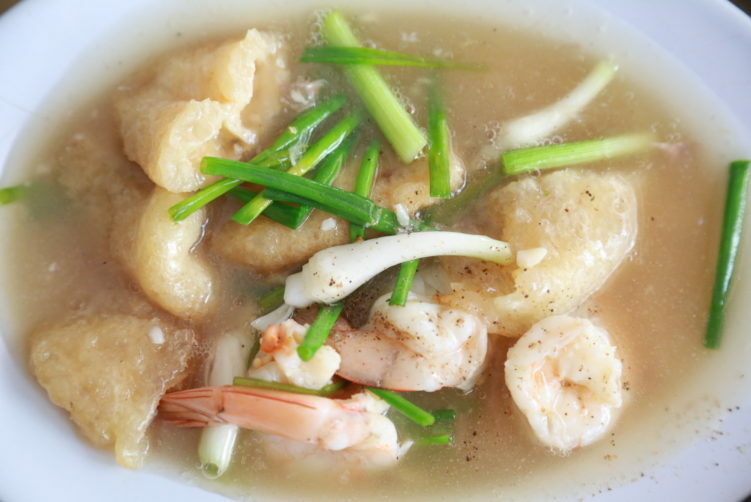 Yong Lee have a variety of Thai dishes such as Tom Yam and fried chicken and cashew nuts, blended in with the more typical Chinese style dishes. Beef tongue soup, steamed bass in plum sauce, a red sauce coated pork-shop with sweet peas, and fried pork bowels are some examples. 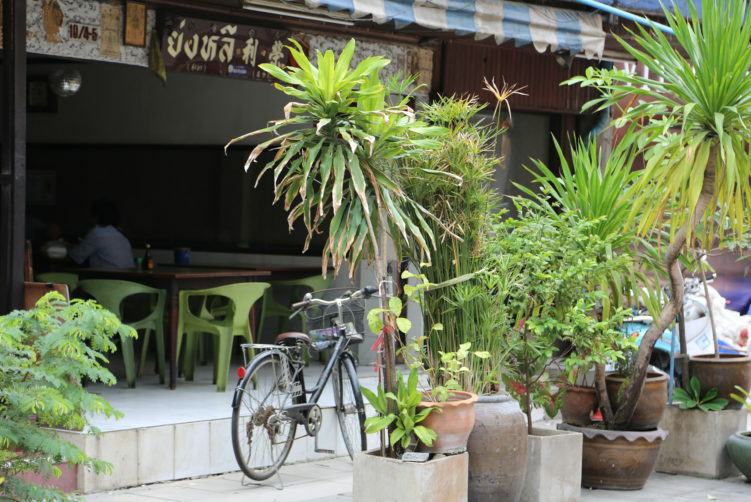 It’s not difficult to spot Yong Lee as the open shop-front towards the street has a jungle of tropical potted plants. Starting out in 1944, they have more than 70 years of experience in serving their customers and is one of the spots you really should visit before it disappears. It’s a laid back back-in-the-old-days spot with absolute delicious food. I have to admit I’m a real admire of these old classic shop houses still serving delicious food. The number is shrinking, and it happens faster than before due to modernization of the city. A couple of other older shop houses with the older generation still being involved is Sai Nampung in Sukhumvit soi 20 where you get a lovely chicken wing soup with cowslip flowers and also a very good yen ta fo. Another one is Lim Yuu Hong in Charoen krung Soi 43, serving one of the best noodles with braised duck in town. Search them up before it is to late. http://www.santacruzpumas.org/research/ click here Open: Mon- Fri 10am – 8:30pm. Closed weekends. https://sheisfiercehq.com/shop/ Prices: dishes are just below 100 to 200. Expect to pay around 250 per person. How to get there: Take BTS to Phrom Phong Station, then Exit # 3. Walk to Soi 39. Yong Lee Restaurant is about 100 meters into Soi 39. Yong Lee in Soi 39 startet out in 1944 and the Sino-Thai food is still made the same way. Delicious, authentic and a should visit if you enjoy good food. See full review at StreetsideBangkok.